INTRODUCTION: Nasal reconstruction is a challenging undertaking for the reconstructive surgeon. Clinical patterns and outcomes in nasal reconstruction in blacks are relatively less well reported. The purpose of this article is to document a review of patients who had nasal reconstruction in our practice, a black African setting. PATIENTS AND METHODS: Clinical records of patients with nasal deformities requiring reconstruction were retrieved. Patient’s biodata as well as type and extent of nasal deformities, etiology of deformities, and outcomes of treatment were documented. RESULTS: Twenty-nine patients were managed over a 15-year period. There were more males than females. The average age was 27 years. Trauma accounted for 62% of cases with road traffic injuries, human bites leading the pack. Defects from resection of skin malignancies were few. The parts of the nose most commonly affected were the alar, tip, and columella. Forehead flap and nasolabial flaps with or without cartilaginous grafts were most commonly employed means of repair. CONCLUSION: Nasal defects were more commonly due to trauma, rather than excision of skin malignancies. Primary suturing of avulsed nasal tissue in human bites should be avoided as necrosis results. Delayed presentation may complicate outcomes. The nose is a prominent structure on the face due to its central location, and it significantly affects the overall facial appearance. Nasal deformities even in the mildest forms are deemed undesirable and may partly explain why rhinoplasty is one of the most frequently performed cosmetic surgical procedures in the Caucasians., These experiences as well as nasal reconstruction are well documented, as are reports on outcomes in Asian nose reconstruction.,, The purpose of this article is to document a review of cases of patients with nasal deformities as seen in our practice, a black African setting. The hospital records of patients with different types of nasal deformities and different degrees of nasal loss that required reconstruction over a 15-year period were retrieved from a single plastic surgery unit of a semiurban Nigerian hospital. The etiology and pathology of nasal deformities, the extent of tissue defects as well as location of defects were retrieved. The types of surgeries performed, the nature of anesthesia employed, the number and stages of surgeries, the use of cartilaginous grafts, and complications of treatment were also documented. The patients who had nasal defects following excision of tumors had primary reconstruction. Those whose defects were due to trauma had adequate first aid care, resuscitation, and, where necessary, appropriate wound debridement followed by nasal reconstruction as soon as feasible. The techniques employed were individualized based on reconstructive needs. For those who had flaps reconstruction, outcome measures of flap survival were full survival, partial flap failure, and full flap failure. The patients were followed up in the outpatient clinic. The review was conducted in accordance with ethical standards on human patient research. A total of 29 patients with nasal deformities were recorded during the period. There were 19 males and 10 females whose ages at presentation ranged from 6 days to 63 years [Table 1] with a mean age of 27.3 years. The most common cause of nasal deformity was trauma in 18 (62%) of the patients; these were mostly from road traffic injuries, gunshot wounds, and human bites. Other indications are shown in [Table 2]. The extent of nasal loss among the patients is as shown in [Table 3], along with the procedure employed for the coverage of the defects. There was more than 50% nasal loss in four patients. 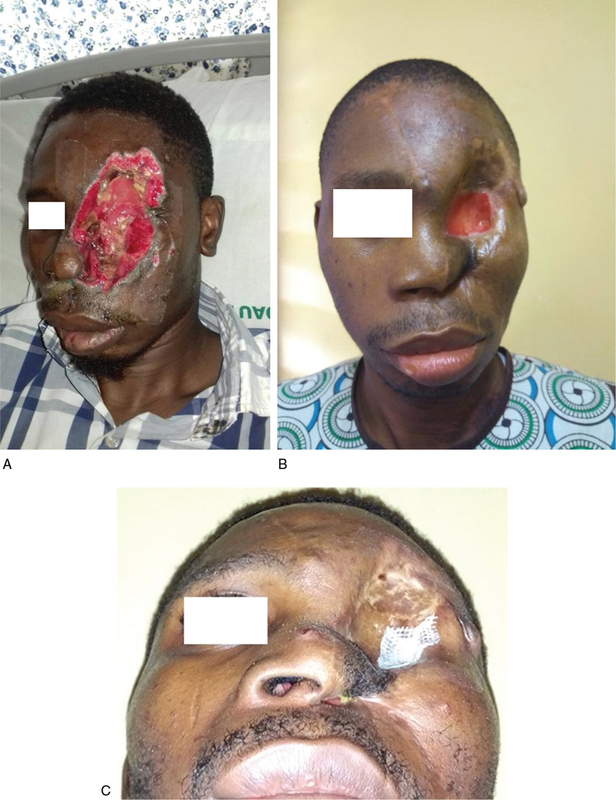 Two of them were due to trauma, one of which is shown in [Figure 1], whereas the third was an albino with advanced squamous cell carcinoma [Figure 2]. Combined lip and alar loss occurred in two patients, whereas birth trauma from obstetric forceps delivery accounted for partial alar loss in three babies. Two of these are presented later in life [[Figure 3]a–d]. Human bites commonly involved the tip, columella, and the alar. Surgical treatment was performed on 26 of the patients, and two patients were lost from further care. One of these was a saddle deformity from road traffic injury who presented 10 months after trauma [Figure 4], whereas the other patient was an albino, who died of advanced carcinoma [Figure 2]. Local anesthesia was employed in eight patients and general anesthesia in 18 patients. 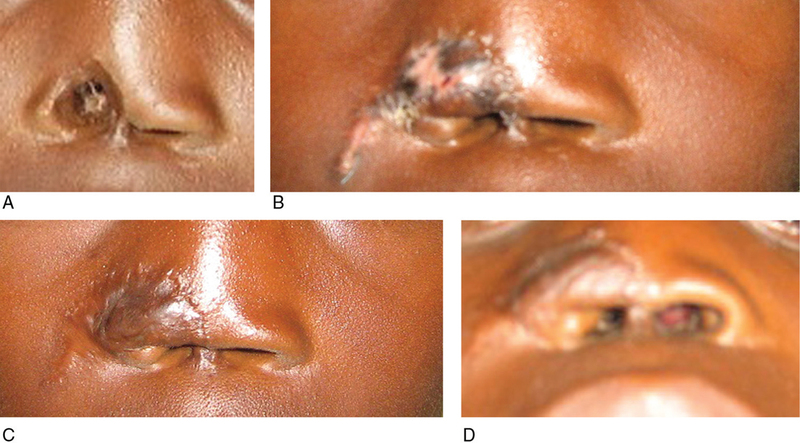 Two of the patients with human bites had their avulsed skin sutured in place as a full-thickness skin graft, but both resulted in necrosis, thereby necessitating debridement and application of full-thickness postauricular skin grafts [[Figure 5]a–d]. 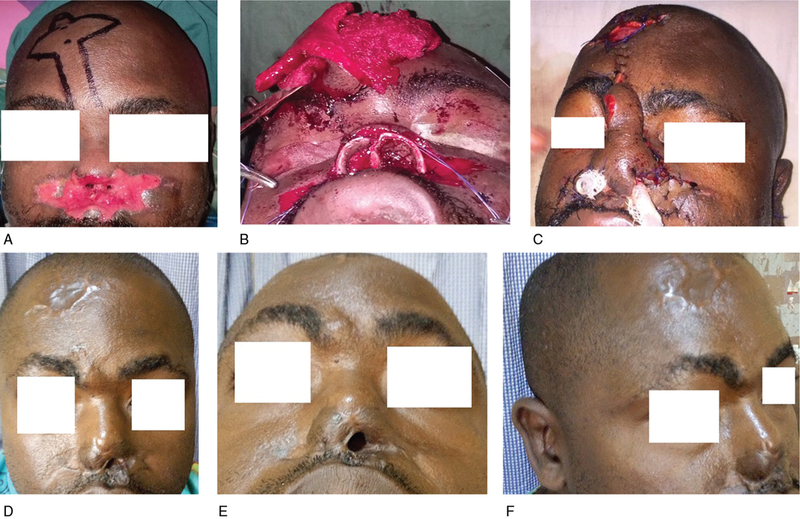 The two-staged forehead flap was employed in five patients in combination with skin grafts, costal cartilage (for nasal septum), or auricular chondrocutaneous composite grafts for inner lining of the nose [[Figure 1]a–f]. 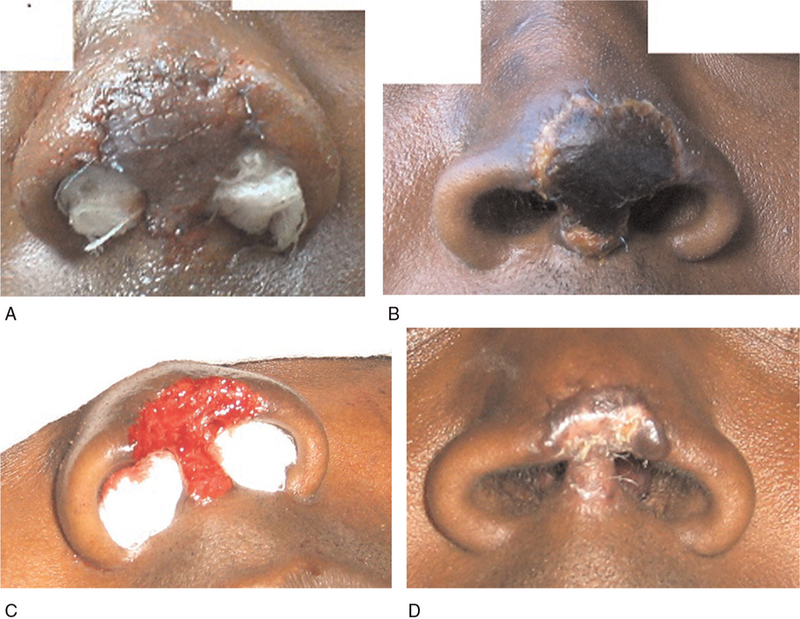 Nasolabial flaps were used to repair the alar in skin only defects [[Figure 6]a and b] and for inner nasal lining as turn-in flaps combined with composite auricular cartilage graft [[Figure 3]a–d]. Composite auricular cartilage graft from the helical rim was also used to augment nostril rim stenosis that resulted from poorly managed trauma [[Figure 7]a–f] and as inner nasal lining (from the concha) in repair of heminasal loss [[Figure 8]a–c]. 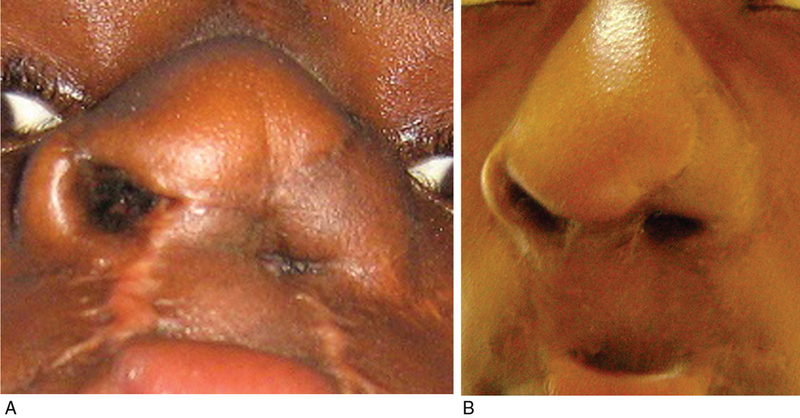 A congenital “floating” alae and nasal bridge defect due to bilateral Tessier 2 cleft which presented later in life was treated with bilateral turnover nasolabial flaps and full-thickness skin grafts [[Figure 9]a–d]. 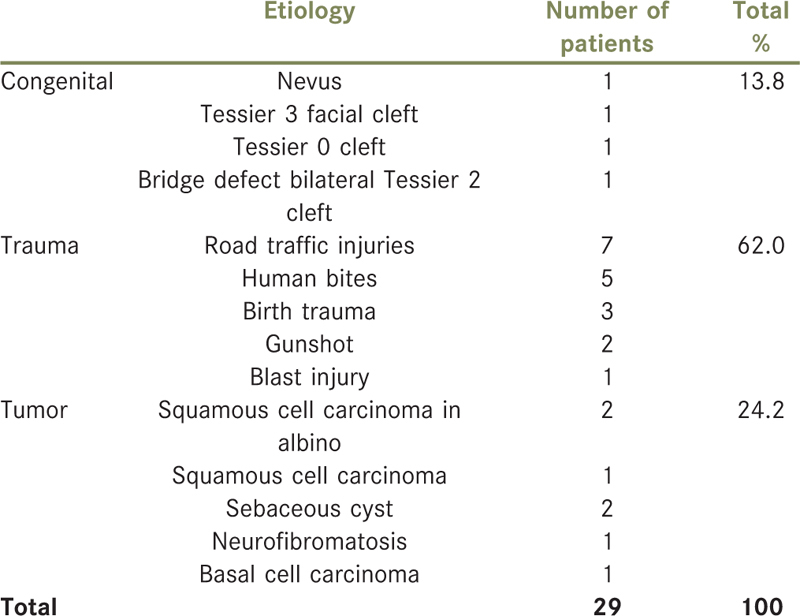 Complications from the procedures are partial flap necrosis (two patients), nasal stenosis (four patients), and partial graft loss (four patients) [Table 3]. The average duration of follow-up is 4.5 months. Collapse of nose following forehead flap repair of an alar defect without cartilage support in a 12-year old had improved in 2 years after surgery without further treatment [[Figure 10]a and b]. The average age in this review is 27 years compared with 59 years in other studies. This may be explained by the fact that the most common indication in our review was trauma, as opposed to resection for skin cancers, either as Mohs micrographic surgery or in the traditional methods of excision in other reviews., Such cancers occur more commonly in the older age group.,, When there is delay in seeking treatment, extensive tissue destruction and invasive spread into nasal cavities and sinuses may lead to patient death or preclude curative resection while requiring the use of more extensive surgical techniques for adequate reconstruction. 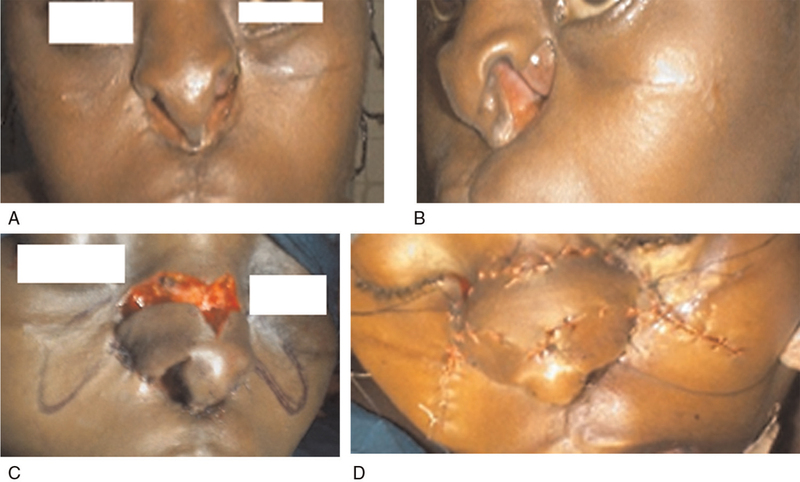 In nasal deformities arising from road traffic injuries, the need for primary reconstruction cannot be overemphasized as delays may result in disfiguring deformities which may be difficult to correct. Congenital causes of nasal defects are generally uncommon, and four cases are reported in this review. Isolated alar defects result from rare forms of craniofacial clefts other than cleft lip and palate. One of our patients had a bilateral Tessier 2 cleft with defect of the nasal bridge with floating alar which was successfully repaired. Infections such as cancrum oris associated with immunosuppression in children with measles could result in nasal loss. The reconstructive challenges are worsened by dense scarring of surrounding tissues which could make them unavailable or precarious for use in reconstruction. Fortunately, these are now rarely seen. Five cases of nasal loss due to human bites are reported. Human bites as well as dog bites have been reported., Human bites commonly involved the tip, alar, and rim of the nose. Suturing the avulsed skin as a full-thickness skin graft should be avoided as necrosis almost invariably results in part due to heavy contamination by intraoral microbes. Trauma to the alar from obstetric forceps delivery occurred in three patients. One patient presented later in childhood. This underscores the need for appropriately skilled personnel in the use of medical equipment to avert similar scenarios. There are several techniques employed in nasal reconstruction, and the choice of procedure depends on the extent of tissue loss, the part of the nose affected, various component tissues involved, and the expertise of the surgeon. This review observed a wide variation in the different types of defects and the need to tailor surgical techniques employed in reconstruction to individual patients. For skin only defects, the “subunit principle” and the “defect only principle” have long been advocated as key guidelines in nasal reconstruction. Full-thickness skin grafts or skin flaps are usually sufficient to manage these defects. When full-thickness defects occur, more extensive and complex reconstructive options have to be employed to achieve the goals of reconstruction. The forehead flap remains the workhorse of extensive nasal reconstruction., It is usually performed in two stages, although a three-stage technique was proposed to improve aesthetic results; the two-stage technique remains the state-of-the-art choice, even for complex defects. It is usually combined with turn-in nasolabial flaps or scar hinge flaps which provide nasal lining. Some of our patients suffered partial flap necrosis of these flaps. Perhaps the use of flap “delay” may help in avoiding such complications. Composite auricular chondrocutaneous grafts are very useful in providing cartilaginous support as well as lining the nose.,, The composite nature makes graft “take” more precarious, and a size of less than 1.5 cm is generally advocated to improve the chances of take. Cooling of the graft to improve take by lowering metabolic demands has also been applied. The graft may assume an initial dusky appearance [Figure 7c], but this improves as blood flow is better established [[Figure 7]f]. The donor ear is not significantly altered following harvest auricular cartilage grafts [[Figure 1]f and 7d]. Narrowing contralateral nostril following defect closure of alar defect may be only feasible where nostrils are morphologically large as in Caucasians, but this may be ill advised in the platyrrhine nose of blacks. Bulkiness and alar collapse are reported complications when cartilage support is not applied to forehead flaps in alar reconstruction. This alar collapse that was observed in a child of 12 years improved on follow-up 2 years later. This may be due to the increase in facial growth at adolescence. There are reports stating that cartilage grafts are not necessary in Asians. Keloid formation remains a challenge with wound healing in predisposed blacks, but none is reported in this series. Some of the patients had unilateral nostril stenosis which required further correction. 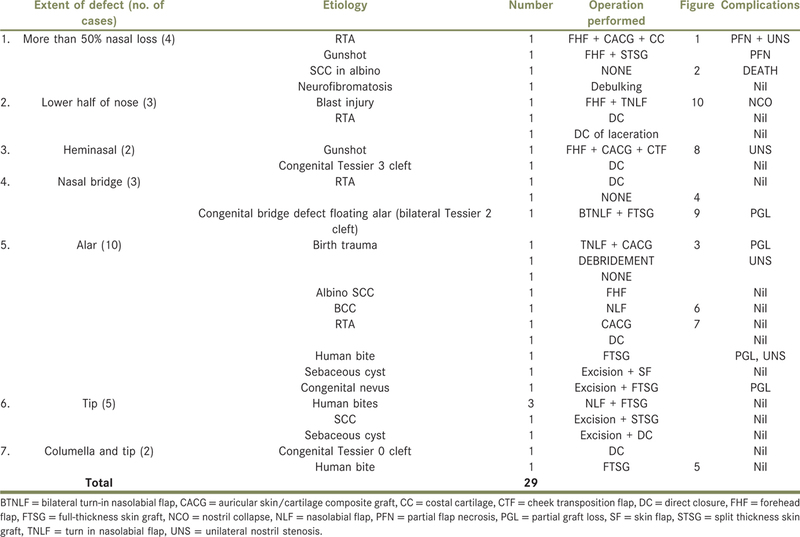 Trauma is the leading cause of nasal deformity requiring reconstruction in this review. In human bites, suturing of the avulsed skin is better avoided as necrosis almost invariably results. Collapse of the nose due to nonuse of supporting cartilage in a young child improved with age. Late presentation in some patients makes reconstruction more challenging and could limit options. Part of this work was presented at the Nigerian Association of Plastic Reconstructive and Aesthetic Surgeons Conference, Sokoto, August 18, 2017. Schwitzer JA, Albino FP, Mathis RK, Scott AM, Gamble L, Baker SB. Assessing demographic differences in patient-perceived improvement in facial appearance and quality of life following rhinoplasty. Aesthet Surg J 2015;35:784-93. Akbari Sari A, Babashahy S, Olyaeimanesh A, Rashidian A. Estimating the frequency and rate of first 50 common types of invasive procedures in Iran healthcare system. Iran J Public Health 2012;41:60-4. Han DH, Mangoba DC, Lee DY, Jin HR. Reconstruction of nasal alar defects in Asian patients. Arch Facial Plast Surg 2012;14:312-7. Gu ZC, Li H, Hamann D, Xu F. V-Y advancement flaps based on Yotsuyanagi Aesthetic Subunit Principles for small nasal defects in Asian patients. Facial Plast Surg 2016;32:315-9. Jin HR, Jeong WJ. Reconstruction of nasal cutaneous defects in Asians. Auris Nasus Larynx 2009;36:560-6. Thornton JF, Griffin JR, Constantine FC. Nasal reconstruction: An overview and nuances. Semin Plast Surg 2008;22:257-68. Oluwatosin OM. Repair of extensive composite alar defects with single stage nasolabial turnover flap and auricular composite graft. Niger J Surg Res 2001;3:6. Zelken JA, Reddy SK, Chang CS, Chuang SS, Chang CJ, Chen HC et al. Nasolabial and forehead flap reconstruction of contiguous alar-upper lip defects. J Plast Reconstr Aesthet Surg 2017;70:330-5. Ghassemi A, Ahmed SS, Ghanepur H, Modabber A. Three-layer reconstruction of lower third nasal defects using forehead flap, reversed nasolabial flap, and auricular cartilage. Int J Oral Maxillofac Surg 2017;46:36-40. Weathers WM, Koshy JC, Wolfswinkel EM, Thornton JF. Overview of nasal soft tissue reconstruction: Keeping it simple. Semin Plast Surg 2013;27:83-9. Temel M, Gunal E, Kahraman SS. Reconstruction of congenital isolated alar defect using Mutaf triangular closure technique in pediatric patients. J Craniofac Surg 2016;27:1087-9. Huang AH, Wong MS. Acute nasal reconstruction with forehead flap after dog bite. Ann Plast Surg 2013;70:401-5. Bhatt Y, Vyas K, Nakade D, Zade M. Reconstruction of nasal defects our three years experience. Indian J Otolaryngol Head Neck Surg 2006;58:51-6. Namdev LN, Darbari A. Nasal reconstruction with forehead flap: Our experience. Indian J Otolaryngol Head Neck Surg 2013;65:177-80. Paddack AC, Frank RW, Spencer HJ, Key JM, Vural E. Outcomes of paramedian forehead and nasolabial interpolation flaps in nasal reconstruction. Arch Otolaryngol Head Neck Surg 2012;138:367-71. Stahl AS, Gubisch W, Haack S, Meisner C, Stahl S. Aesthetic and functional outcomes of 2-stage versus 3-stage paramedian forehead flap techniques: A 9-year comparative study with prospectively collected data. Dermatol Surg 2015;41:1137-48. Yazar M, Yazar SK, Kozanoglu E, Diyarbakirlioglu M, Eren HI. Use of turn-in skin flaps for nasal lining reconstruction. Dermatol Surg 2017;43:1208-12. Hessam S, Sand M, Georgas D, Kassa T, Bechara FG. Scar hinge flap for inner lining reconstruction of full-thickness defects on the ala of the nose. Rhinology 2015;53:167-70. Kim G, Jeong YI, Shim HC, Choi JH, Jue MS, Kim EJ et al. Auricular composite chondrocutaneous grafts in the repair of nasal alar rim defects. Ann Dermatol 2014;26:407-8. Lin W, Qing Y, Liu J, Cen Y. Alar flap combined with free auricular composite flap for the reconstruction of nasal alar defect. J Craniofac Surg 2015;26:562-4. Choe YS, Kim MW, Jo SJ. A novel approach for full-thickness defect of the nasal alar rim: Primary closure of the defect and reduction of the contralateral normal ala for symmetry. Ann Dermatol 2015;27:748-50. Funayama E, Yamamoto Y, Furukawa H, Murao N, Shichinohe R, Yamao T et al. Full-thickness entire nasal alar reconstruction using a forehead flap in Asians: No cartilaginous infrastructural lining is necessary. J Craniofac Surg 2017;28:734-7. Daya M. Nostril stenosis corrected by release and serial stenting. J Plast Reconstr Aesthet Surg 2009;62:1012-9.